Instruction is synonymous teaching, but too much instruction can actually stifle the curiosity we want to encourage in our little buddies. In my class Rainbow Robots, I’m trying to walk this fine line and encourage our budding scientists to explore, hypothesize, and test out their theories… without sacrificing their curiosity! Young children are natural scientists. 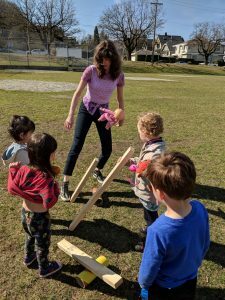 We tend to think of science as something that happens in the confines of a lab, but science is happening all around us…especially in a classroom full of tiny humans! Preschoolers are new to the world and seek every opportunity to figure out what they don’t yet understand. This not knowing is the starting point for science. Not knowing how the world works drives children to form and test out theories about how it might work. The more opportunities they have to test their theories, the more they learn! Rainbow Robots is all about exploring, researching, and documenting the work of our Big Kids as they test these theories out! This season, we’re focusing on the simple machines that make our lives easier: ramps, levers, pulleys, wedges, wheels and axels, and screws! 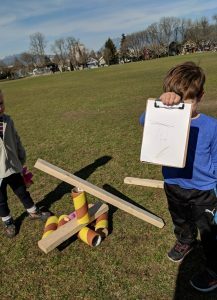 On Thursday afternoons, you’ll find us making observations, conducting experiments, documenting our work, and making a mess as we put the “Rainbow” in Rainbow Robots with art projects that bring science and art together! 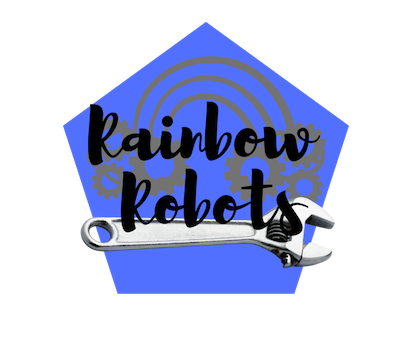 Curious about Rainbow Robots? Join us at Broadway from 1 – 4pm on Thursdays! You can catch us doing research in the field on April 11th as we ascend to the top of the Vancouver Lookout to investigate a pulley system in action!